Finally the review! Sorry if this is a day late, this bookworm's social calendar spiked so pardon the delay. Anyway as I just published the Series 101 for Adventures of Owl yesterday, I thought I'd address my questions myself and give you all feedback per point. What to Expect: Lots of action and interesting otherworldly characters. There's a dragon, a couple of nagas, nymphs, vampires, Japanese ghosts, skin walkers, and an adventure spanning continents. OWL AND THE JAPANESE CIRCUS starts off in Vegas then Kristi Charish takes us to the metro streets of Japan and its Harajuku district, then she had us looking for a scroll in an ancient temple in Bali, Indonesia, and finally going back to a haunted Vegas casino/hotel where hell breaks loose. It was a trip in every sense of the word so fasten your seat belts because it's going to be one heck of a ride! Mythology & Cosmology: There's ins't a particular myth or pantheon that KCharish employed here. Owl's first adventure is more of treasure hunt like Indiana Jones meets Lara Croft, as KCharish aptly made comparisons with, and the origins of this scroll isn't hinged on anything specific. Ironically Owl's real life adventure is very much like the MMRPG she's addicted to. On a side note, I love Owl's hobby and her whacked game friends. Owl aka Alixandra Hiboux: Finally a heroine who is as bubbly, interesting, and colorful as the "sidekick". I love Owl so much I want to be her BFF! So Owl is some sort of a loner (I guess because of her job?) and this rolling stone lifestyle dulled her social skills and tact because Owl almost has no filter. She doesn't care about politeness or etiquette and barely has self control when it comes to courting danger. She's very entertaining and I so love her quips because it gets her in trouble 99% of the time. Oh and she has a super cool Mau cat named, Captain, who also serves as a vampire detector/alert. The Others: Owl's BFF is the gorgeous and equally smart, Nadya, who is fun, quirky, and just as interesting as Owl. Nadya's a flirt, has a certain degree of fluency in ancient languages, covert, and very much like Owl. Then there's Rynn, Owl's pseudo therapist who also works as a bartender and has the hots for Owl. He's the "silent but deadly" kind of guy, not really an Alpha male, he's not domineering or on a power trip, Rynn has a certain strength and quietude about him that balances Owl's daredevil behavior. The Archetypes: There are some "archetypes" but just enough to make things familiar. KCharish didn't go crazy and made her creatures so unique they're practically a new breed of Supes. She merely put her own stamp on things to fit her story. For example, her vamps drink blood, they're allergic to garlic and has an aversion to UV light but they're power lies on the pheromones, which smells like lily of the valley, they give off to enthrall their prey. KCharish's dragon, yes! DRAGON! is clever, greedy, and scary. There are other creatures here and like I mentioned they're unique in their own way but the ones I mentioned headline OWL AND THE JAPANESE CIRCUS. Finally: I was really hooked on OWL AND THE JAPANESE CIRCUS from beginning to end. The human element of the story is great, Owl is a complex character and I find her flaws very endearing. KCharish's storytelling is upbeat, funny, and I love the fact that the focal point is not on the romance but on Owl's adventures. I love how the story is woven, the plot isn't layered but it's not static either. We might be on Owl's first adventure but I can already tell that there's a continuity to the story, not in terms of a series arc but the plot for Owl and the City of Angels has already started here. Anyway, I'm sure you'll be seeing this book around the sphere and if the reviewer gives OWL AND THE JAPANESE CIRCUS glowing reviews, BELIEVE IT! Adventures of Owl is a series that will be on a lot of people's list and I'm sure KCharish will have a huge and solid following because of it. 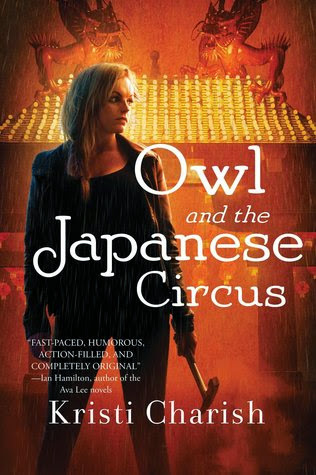 Don't forget to check out the GIVEAWAY where you can enter for a chance to win a signed copy of OWL AND THE JAPANESE CIRCUS. Contest ends 1.7.15. Try this, make it first on your list! I'm glad you had a nice time as well with this one, I really liked it as well, so fun to read it! Curious to discover book 2. thanks for the review! Oh! Some how I missed your other post about the series. I love Indy Jones/Lara Croft style adventures. And you mentioned 'dragon' so I'm in. I like books with heroines that have a good personality. This sounds like a really good adventure type of book. Nice review, SW.
Owl has the "sidekick" personality: fun, adventurous, unfiltered. You'll definitely like her. Give it a shot, I know you don't read books like this much but maybe this will be the exception? Yay! I'm so happy that you loved this! I pre-ordered it yesterday for Kindle and can't wait to get it! I had a hard time getting into this one, but I'm glad you enjoyed it. Hope you're having a great weekend! dragons and a treasure hunt..dang I added this to my list!